You are here: Home / Foot Care Blog / Athlete's Foot / What Is A UV Shoe Sanitizer? Why Is A UV Shoe Sanitizer Needed? Approximately 35 million Americans have toenail fungus, according to the APMA. This fungus is very expensive to treat, especially using the most effective laser method. Yet, the possibility of reinfection is very high if patients are not careful about limiting their exposure to fungi. “Every step we take compresses the sock and squeezes the germs and sweat back and forth between the foot and the shoe. There has been no way to clean the inside of our shoes, until the SteriShoe sanitizer, so we don’t think about what’s growing inside them,” said Adam Ullman, president and CEO of Shoe Care Innovations, in a press release. A UV shoe sanitizer is also recommended for diabetic patients (who run the risk of foot amputations), people with particularly malodorous feet, and the Americans who are especially susceptible to athlete’s foot infections. How Does A UV Shoe Sanitizer Work? It’s no secret that UV light is a powerful sanitization tool. UVC light is a powerful germicide that is routinely used in hospitals and other health care facilities. One study by Duke and University of North Carolina researchers found that UVC light could eliminate some of the most problematic, antibiotic-resistant germs found in hospitals. “The findings of this study suggest that UV light could hold promise for eliminating bacteria from hospital rooms and reducing the risk of infection with these difficult bacterial pathogens in the healthcare environment,” wrote Liise-anne Pirofski, MD, a chair for the Infectious Diseases Society of America. This is just one report from a wealth of research that supports the use of UV light to kill bacteria, fungus and pathogens. We all know that UV light exposure is not recommended for people, however, due to its powerful nature. So the manufacturers outfitted the device with a number of safety features, including an automatic shut-off, shoe bags that block all UV light from the user, and a compression sensor that requires the device to turn-on only if it’s actually inside a shoe. After a brief 45-minute cycle, the disinfected shoe is ready for wearing again. Why Is SteriShoe The Best Sanitizer For Shoes On The Market? SteriShoe® is the only UV shoe sanitizer with a “Seal of Acceptance” from the American Podiatric Medical Association. The product was developed with input from three distinguished medical professionals — Dr. Bryan Markinson, Chief of Podiatric Medicine and Surgery at the Mount Sinai School of Medicine; Dr. Andrew Shapiro, a board-certified podiatric surgeon and trustee for the New York State Podiatric Medical Association; and Dr. Warren Joseph, a fellow of the Infectious Diseases Society of America. Given the level of professional experience that went into the development of this product, it’s no surprise that thousands of doctors across America are now recommending this UV shoe sanitizer to their patients. Furthermore, the SteriShoe® device was independently studied for clinical efficiency by the distinguished Dr. Mahmoud Ghannoum, director for the Center of Medical Mycology. His results showed that the average treatment killed over 80 percent of the microbes (including bacteria, fungus, MRSA) inside a shoe, with some results going up to a 99.9 percent kill rate. Dr. Ghannoum concluded that the SteriShoe® UV shoe sanitizer is an effective method of “reducing the fungal burden in shoes” and a means of “breaking the foot infection cycle.” His findings were published in the July/August 2012 edition of the Journal of the American Podiatric Medical Association. “Buyer beware: the shUVee is a scam,” warns Dr. Mark E. Spier, a doctor of Podiatric Medicine from Columbia, Maryland. He points to a claim filed in June of 2012 by the Electronic Retailing Self-Regulation Program (ERSP), the investigation branch of the Better Business Bureau. In this claim, the ERSP recommended that Angel Sales, Inc. modify or discontinue false advertising claims for the shUVee Shoe Deodorizer. 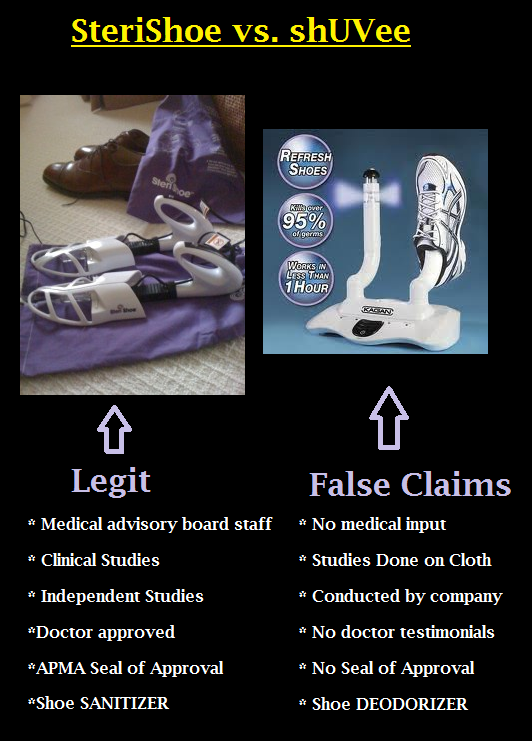 The manufacturer voluntarily rescinded claims that the product used UV light to sanitize the shoes, that clinical studies had been conducted, and that “many doctors” recommended the shUVee product. The so-called “laboratory tests” were conducted by the manufacturer using a shUVee prototype on pieces of cloth and plastic. Though some germ-killing ability was reported, no test evaluated the product’s performance once it was inside a shoe and there were no independently conducted studies to verify the manufacturer’s data. A Fashion and Health Dilemma: Are Your Ugg Boots Harboring Foot Fungus?